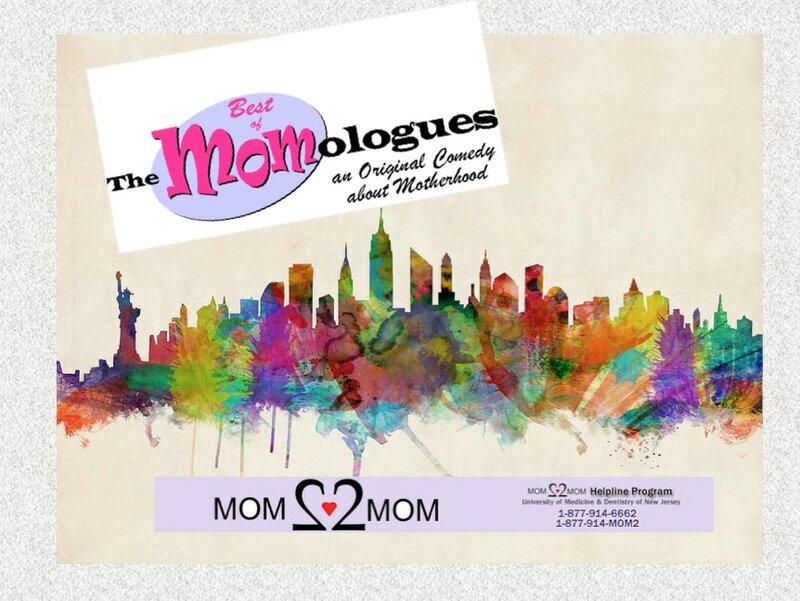 The MOMologues was conceived by director and writer Lisa Rafferty, who searched in vain for a play that offered an honest, funny look at motherhood. Lisa teamed up with fellow moms Stefanie Cloutier and Sheila Eppolito to write a show based on stories and experiences from the trenches of raising eight children among them. The Result...a one-act play that followed four women through the first chapters of motherhood − attempts at conception, pregnancy, labor and delivery, and adjusting to life with a newborn. The initial one-act play debuted at the Footlight Club near Boston to a sold-out audience of moms, who howled in appreciation. Answering the call of moms everywhere who said, "Give us more! ", we expanded our humble one-act into a full-length show, covering universal mom situations like the differences between raising boys and girls, how to handle the Tooth Fairy, picky eaters, discipline, kids peeing in the playground and all the rest of the real-life comedy that is motherhood. Our original comedy, The MOMologues, begins at the beginning – trying to get pregnant – and ends with seeing the first little miscreant onto the bus. It premiered at the Institute of Contemporary Art in Boston in 2002, where it promptly sold out, leaving us scrambling to add more shows. Our baby subsequently grew into a five-week run at the Stuart Street Playhouse/Second Stage in 2004, and enjoyed its overseas debut in the Netherlands in 2004. It has since been performed over 1,000 times, each time leaving moms laughing. We couldn’t be prouder of our first-born! Not content with just TWO babies, we just HAD to have a third. This one takes parents through the “joy” of shepherding surly offspring through the minefield of adolescence before pushing them out of the nest and into adulthood. (HA!) Our last baby is still pretty new, and is just starting to make its way out into the world, joining its older siblings at theater companies everywhere. Combining all three shows into one raucous night of theater, Best of… takes audiences from conception to college in one fell swoop. 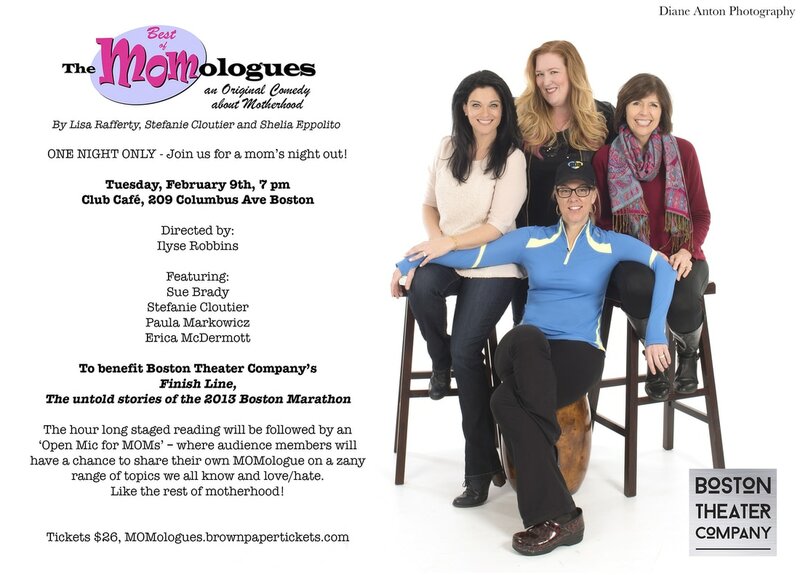 Best of… started life as a one-night benefit for the Metro Stage Company in Cambridge, MA, in 2010, featuring WCVB/Channel 5 News Anchor Bianca de la Garza, film actresses and ‘sistahs’ from The Fighter, Erica McDermott and Melissa McMeekin, Ellie Fund Executive Director Julie Nations, actor-director-choreographer Ilyse Robbins and original MOMologues cast member Cinda Donovan. I loved it! A must-see for my sisters, mom, and friends! 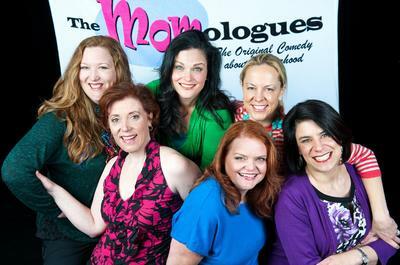 The show captures the heartwarming — and at times wrenching — pathos of this thing we call motherhood. We had a wonderful time! "What a wonderful show! I was at the show in Arlington last week, and wanted to know if the original show would be returning and if so when? Thank you for a great night of laughs and tears." "A happy, fun, sentimental, teary, wonderful night!" "Loved it! My cheeks were sore the next day. We've paid big bucks to see George Carlin and other comedians and never laughed that hard. I think that the real success of humor is when it's a subject/situation that others can readily identify with. The MOMologues pulled that off. The cast did a great job in their tone, inflection and timing." "The show really stayed with me. I spent the next day alternating between tearing up and laughing!" 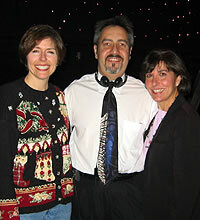 "For empty-nest parents, it's a great trip down memory lane!" "The show was wonderful, written by real women, performed and produced by real women, for all women!" "Amazing how the comedic can slide to pathos. Beautifully done!" "Heart wrenching and gut-busting entertainment!" "I loved it! My friend and I were laughing so hard, between relating to the pregnancy topics from the first act and remembering our moms saying some of the same things to us as kids from the second act, we almost had to run out to get to the bathrooms! It said in the program that they are working on a sequel — looking forward to seeing that as well!" "My girlfriend slept over after the show, and we stayed up for hours talking it over and laughing!" "Several friends and I saw the Boston show ... we all loved it and still break into uncontrollable laughter!" MOM1 a Hit in Holland! Belgium follows suit! The Dutch and Belgium tours featured well-known actors from film and television, and have been a critical and commercial success. 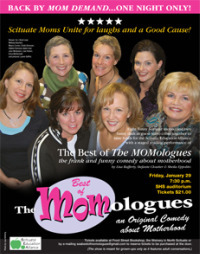 'The Best of The MOMologues' recently played an encore performance as a fundraiser for the Scituate Education Alliance. 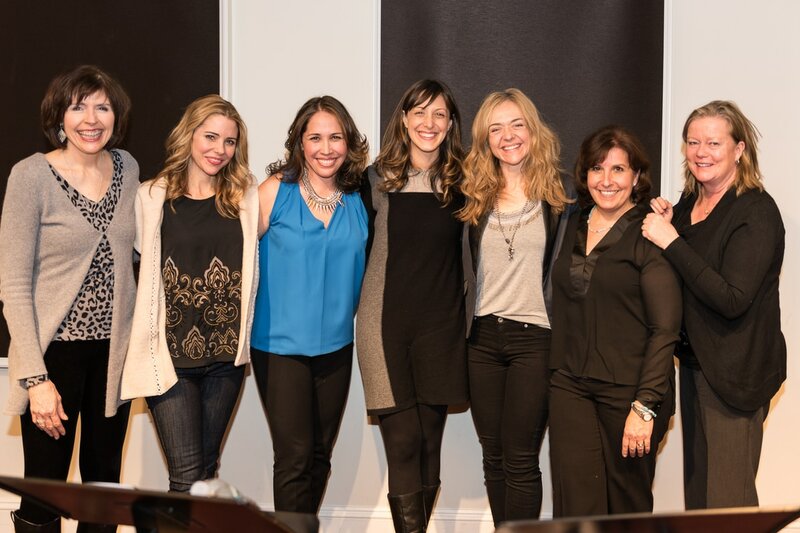 A stand out cast of Broadway actresses presented The MOMologues as a part of a staged reading to benefit for the Susan G Komen for the Cure. 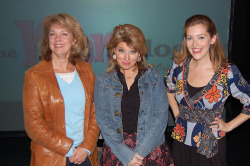 Directed by and featuring Michelle Pawk, the production also starred Liz Larsen, Sandy Rustin and Ann Harada (not pictured). 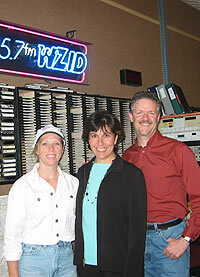 Stefanie Cloutier & Lisa Rafferty with WZID promotion director Jim Roach at the WZID "Old-Fashioned Christmas Show,"